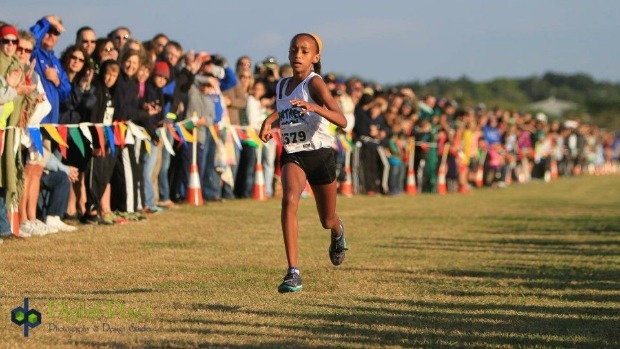 Pine Crest seventh grader Tsion Yared took the lead early and was never seriously threatened in a commanding performance on her way to her first FLYRA MS State Championship. Tsion hit the mile marker at about 5:22 with the next runner some 13 seconds back. She emerged alone from the wooded trails and ran the final 300 meters solo. Tsion’s blazing time of 10:39 smashed the former FLYRA MS XC State Meet record of 10:54 set by Emma Rudman in 2011. Tsion also broke her old XC 3k PR by some 36 seconds. The contest for second place in the Girls Championship Race was the most exciting and competitive “race within the race” at Holloway Park on Saturday. The three contestants were seventh grader Rahyah Andressohn, seventh grader Natalie Varela and sixth grader Bella Pawloski. Natalie went through the mile mark first at about 5:35 with Bella about a second behind Natalie. Rahyah was about 4 seconds back and took the mile at about 5:40. Over the next 1000 meters or so, Rahyah made a move and passed both Natalie and Bella. When the trio emerged from the woods with about 300 meters to go, Rahyah had a two step lead over Natalie and Bella was about 5 meters behind Natalie. With about 80 meters left in the race as they were headed down the final finishing straightaway, Rahyah had a step lead over Natalie and Bella. Bella was running off Rahyah’s right shoulder while Natalie was running off Rahyah’s left shoulder as they sprinted down the straightaway. With about 50 meters to go, Rahyah looked over her shoulder to the left to see where her fellow Miamian Natalie was. Meanwhile, Bella with arms pumping was gaining ground on the right. In the final 20 meters or so, Bella edged in front of both Rahyah and Natalie and took second place in a new personal best time of 11:04.70. Natalie (11:05.00) outleaned Rahyah (11:05.10) by one tenth of a second to take third place. Both Natalie and Rahyah ran new personal bests. Only four tenths of a second separated these three competitors as they battled over 3000 meters! Seventh grader Ashley Klingenberg (11:12) took fifth place using a blistering final 300 meters to overtake sixth place finisher, sixth grader Mahdere Yared (11:17) who had about a 5 meter lead over Ashley as they emerged from the woods into the final open 300 meter segment of the course. Ashley dropped 21 seconds off her PR while Mahdere dropped 33 seconds off her PR. 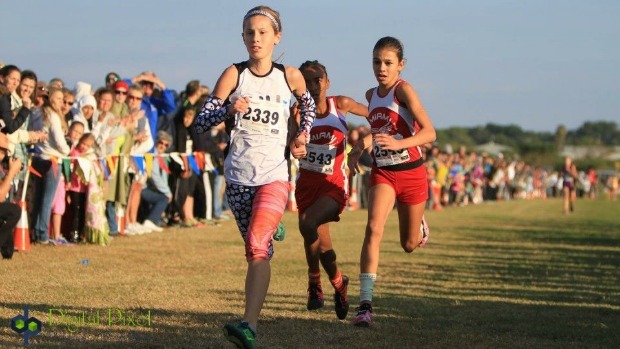 Eighth grader Charis Ivey (11:23.40) captured seventh place running a 6 second PR and closing with a flourish to outlean hard charging seventh grader Audrey McAnally (11:23.50) who took eighth place with a new 20 second PR. Eighth grader Jaden Ault (11:25) was a surprise ninth place finisher. Jaden was in 12th place heading up the hill after the mile marker. She passed 3 runners in the last 1300 meters to claim her place in the top ten. Jaden ran an amazing race lowering her XC 3k PR by a whopping one minute nineteen seconds! Meanwhile, only one second behind her was fifth grader Ani Veltcheva (11:26) who took tenth place and put an exclamation point on youth being served in the Girls Championship race. Ani was in 20th place climbing the hill after the mile mark and passed 10 runners ahead of her in the final 1300 meters to earn the final spot in the top ten. The Pine Crest Panther Nation won the FLYRA MS Girls Team Championship. Led by Champion Tsion Yared and sixth place finisher Mahdere Yared, the team scored 81 points. Other scorers for Panther Nation were Amanda Schwartz, Britta Strain and Samantha Gonzalez. The Big Red Machine known as the Tavares Middle School Patriots earned second place at FLYRA’s MS Girls Team Championship with a score of 108 points. The Patriots’ top 5 scorers were Savannah Schwab, Chablis Shreffler, Adriana Montalvo, Emily Burris and Naomi Filkin. Holy Comforter Episcopal out of Tallahassee captured third place in the FLYRA MS Girls Team Championship with a score of 132 points. Holy Comforter’s top 5 scorers were Katherine Resavage, Hannah Hosay, Avery Smith, Ella Thames and Elizabeth Calabro. 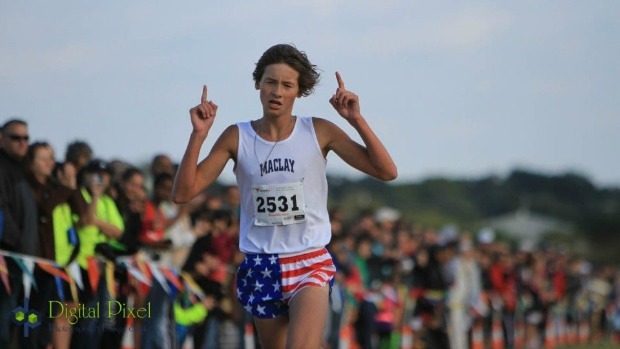 Maclay eighth grader Clay Milford came into the FLYRA MS XC State Meet with a state leading time of 9:41 at the 3k distance. On Saturday, Clay emphatically confirmed his top ranking while running an impressive time of 9:56 and earning his first FLYRA MS State Championship. Clay ran a measured race getting stronger as the race progressed. He was not among the first few boys who crested the initial uphill ascent after the start of the race. By the mile marker, however, Clay was sharing the lead with seventh grader Mamush Galloway at the front of a lead pack of six runners. They took the mile out in about 5 minutes flat. At the hill just past the mile marker, Clay gained a few steps of separation running up the hill and then gradually built on that lead over the balance of the race. Clay ultimately stretched the lead to 10 seconds by the finish line. Eighth grader Nick Kamen (10:06) was a surprise second place finisher. Nick ran a brilliant race dropping his PR by some 33 seconds and outrunning 5 athletes ranked ahead of him in the MS 3k State rankings. He was smartly positioned in about 5th place at the mile marker and worked his way into second place over the next 1000 meters. By the time the runners were emerging from the woods, Nick popped out some 5 seconds after Clay and some 5 seconds ahead of eighth grader Gabriel Curtis. Eighth grader Gabriel Curtis (10:12) also ran a tremendous race lowering his PR by some 22 seconds. Gabriel was in the lead pack at the mile running in the top 5 about one second behind the pack leaders. Over the next 1000 meters, Gabriel passed two of the other front runners and was in third place coming out of the woods. He maintained his position over the final 300 meters and finished strong in third place. Three athletes competed hard for fourth place. Eighth graders Andrew Shepherd and Wesley Cusack and seventh grader Mamush Galloway traded positions all over the 3k course length. At the mile marker, Mamush had a two step lead over Gabriel where both were in the top 5 in the lead pack. Wesley was in 11th place at the mile about 5 seconds behind the lead pack. When they emerged from the woods, Andrew and Wesley ran out shoulder to shoulder with Mamush some two steps behind. Over the final 300 meters, Andrew gained some separation and claimed fourth place with a new 45 second PR running 10:14. Meanwhile, Mamush passed Wesley over the final 300 meters to earn fifth place with a new 25 second PR running 10:16. Wesley finished strong himself running 10:17 and beating all of his cross town Miami rivals from Belen. Eighth grader Cipriano Martinez (10:19) was a complete surprise as the seventh place finisher. Cipriano had only two races in the Mile Split database before the FLYRA MS Championships and his times in those races gave no hint of the fitness he showed on Saturday. Cipriano was the picture of consistency in his race. He was in seventh place at the mile marker, in seventh place emerging from the woods and seventh place at the finish line. Cipriano ran a 46 second PR to punch his ticket to a top 10 finish. Eighth grader Henrique Souza (10:26) earned eighth place by running an impressive 30 second PR over the XC 3k distance. 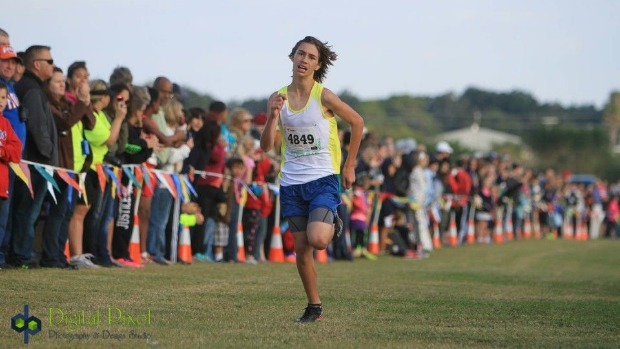 Henrique also ran a very consistent race as he was in eighth place at the mile marker just ahead of his Belen teammates Rodrigo Madiedo and Sebastian Roa. Teammate eighth grader Sebastian Roa (10:28) completed an impressive cross country season with a solid performance finishing ninth. Eighth grader Josue Reyes (10:31) ran a strong race finishing within one second of his own PR of 10:30. Josue took the race out hard and was in the lead pack of 5 runners at the mile. He had enough left in the tank to hold off several other athletes looking to claim tenth place. 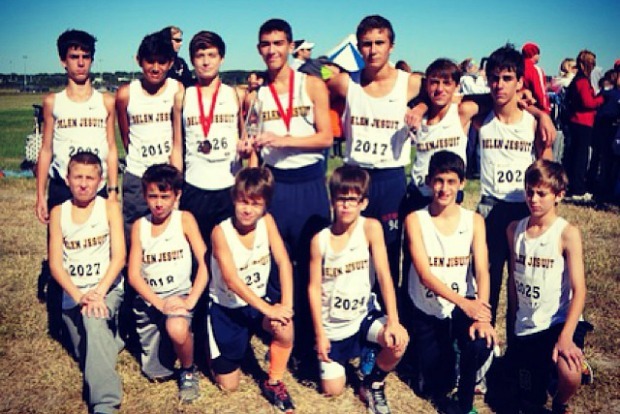 Belen Jesuit Prep won the FLYRA Boys Middle School Team Championship with a team score of 47 points. Belen was led by their top trio of eighth graders Henrique Souza, Sebastian Roa and Rodrigo Madiedo. Luciano Bettocchi and Giancarlo Benitez were the other two scorers for Belen. 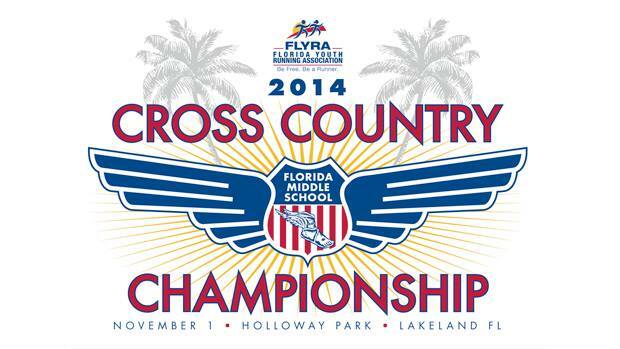 The Tavares Middle School Patriots, showing strong balance in their boys and girls program, earned second place in the FLYRA Boys Team Championship. Tavares scored 92 points which was good enough for a wafer thin 1 point margin over Maclay School. Tavares’ top 5 scorers were Hunter Boyd, Dalton Brown, Garrett Schilling, Keenan Collignon and Tim Feezor. Maclay School took third place in the FLYRA Boys Team Championship with a team score of 93 points. Maclay’s scorers were MS State Champion Clay Milford, Johnny McClure, Jay McDuffie, Keenan Milford, Max Eastman and Alfredo Paredes.